Do you need a mini airbrush kit to complete your masterpieces? Try this one! A high performance dual-action airbrush with 7ml fluid oil-less cup capacity and 0.3mm fluid high precision nozzle will makes super fine spray, and the portable&practical air compress, the proper working pressure range will make the output fluid steady, which will achieve your needed high quality spraying effect and make your ideal come true. Perfect for artwork, nail art beauty, body art,model design painting, cake decoration, craft, fine art such as car painting illustration, beauty and make-up. So don&apos;t hesitate, just take it home! 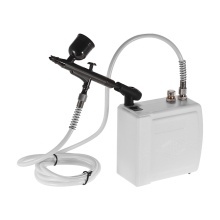 Multi-Purpose Airbrushing System Kit Includes a portable air compressor, air hose, dual-action gravity feed airbrush, mini air filter, a holder, a separator, a replaceable needle and nozzle, and tools. Professional Dual-Action Gravity Feed Airbrush is widely used in model making, cake decorating, tattoos, nail art, etc. High Performance Precision Airbrush will allow to spray from hairline up to 1-1/2 inch wide patterns and delivery super fine painting and steady output fluid. Oil/water separator is designed for separating and releasing water of the compressed air so that the water does not mix with the oily painting for reaching better painting effect. Dual-action trigger and adjustable knob at the end of airbrush, easy to control the paint flow; Operation lever adopts heightening design, effortless and easy to spray. Made of high quality stainless material, long durability; easy to disassemble and clean the airbrush, offering extra 0.3mm nozzle and needle for replacing. Compact and smooth airbrush surface design, comfortable to touch and hold. Comes with a sturdy and exquisite aluminum alloy packing case to make it organized. Quite and premium mini air compressor, portable light weight and easy to carry around. Support automatic on/off, can realize automatically shutting off air when not in use. Good choice for you. After use, please clean the airbrush to avoid clogging.